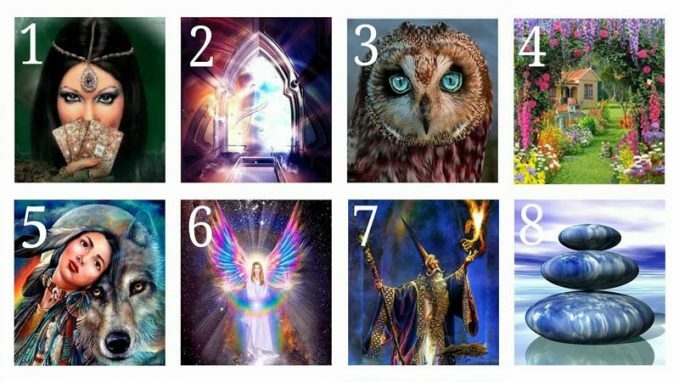 Your Message For The Week: Which Number of Angel Are You Drawn To? 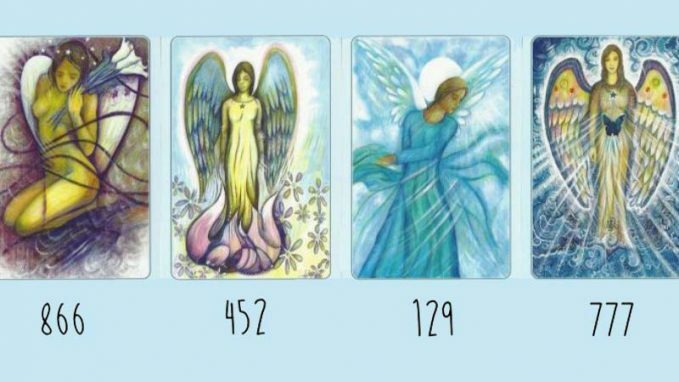 WHICH ANGEL NUMBER ARE YOU DRAWN TO? Angel number 866 is a message that you are about to part ways with something in your material world, such as selling a possession. If you do not intend to lose or sell anything in your material life, you can change your thoughts and alter this direction. However, if you are intent on selling or detaching material in your life, consider this a sign that your wish is about to come true. Angel number 452 is a message that the hard work you have been doing has manifested new opportunities and changes in your life that will rapidly advance you along your Divine life path and soul mission. Trust that any projects will succeed and your goals will be attained. Angel number 129 is a message that your angels are prompting you to fully live your divine life purpose and soul mission. Trust that you have the skills and talents to live your passion and purpose when you apply yourself. You are the only one qualified to fulfill your life role and purpose. Take assertive action related to your spiritual interests and passions on a daily basis. The angels applaud you…congratulations, you are on a roll! 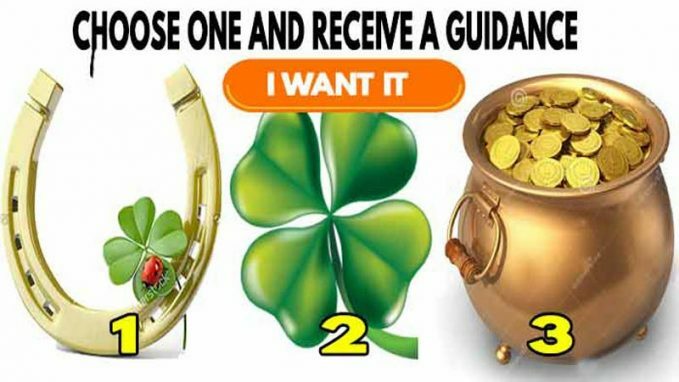 Keep up the good work and know your wish is coming true! This is an extremely positive sign and means you should also expect more miracles to occur. Although it may seem surprising, with only a picture, a card or a drawing … you can define aspects of your life and your personality, that you did not expect to have. take a deep breath and calmly look at the pictures of these cards for a brief moment. Which one of these are you drawn to the most? Scroll down to read the messages each one reveals. Look carefully at the 8 cards and choose the one that appeals the most to you. This pick encourages you to trust your inner guidance and to embrace the intuitive wisdom that resides within your soul. By drawing this card, you are being urged to honor your sensitivity at all times and to prioritize your premonitions and hunches above practicality and logic. This isn’t a time to be influenced by others’ opinions or to betray your inner guidance in order to fit in. Instead, you must trust your intuition, for it will never let you down. You are now being encouraged to spend quiet time alone. Nature and the outdoors will enhance your connection to Source and align your soul with Mother Earth. Likewise, regular prayer, meditation, listening to beautiful music, mindful breathing, and exercises such as yoga or Qigong will enhance your intuition and help develop your clairvoyant, clairaudient, clairsentient, and claircognizant abilities. In order to improve your current situation, you are being asked to adjust to, and harmonize with, the natural rhythm and cycles of your life — cycles that are encouraging you to trust your inner guidance. When you’re indecisive and unsure, always go within, for your intuition knows the path that serves your greater good. When you trust in yourself and your connection to the Divine, you will synchronistically be led to where you need to be. Animation: My intuition leads me to where I need to be. This pick indicates a time of major transition and transformation that will result in significant personal growth. You have entered a period of spiritual awakening and rebirth, where you have the opportunity to align with your higher self and overarching principles that guide you. There is where you surrender to the changes around you and prepare to be the best you can be. You are being encouraged to trust and believe that a magical future awaits, but first, you need to let go of the old in order to experience the new. Take time to re-evaluate your core values and re-examine your life, then eliminate any superficial foundations that don’t align with your higher self and your dreams. This is a time to recognize and rise above any ego-based thoughts and behaviors, for humility and authenticity are the keys to your success. In order to improve your current situations, you are being asked to adjust to, and harmonize with, the natural rhythm and cycles of your life – cycles that are leading you toward a higher level of understanding and awareness. This transformation is inevitable, so know that this is a very exciting time . . . for you are about to become the best you can be. Animation: Through personal transformation, I reach my greatest potential. This pick indicates a need to exercise restraint and self-control in every area of your life. Perhaps you are overeating, drinking too much alcohol, smoking, overmedicating or taking drugs, overspending, exercising excessively, consuming too much sugar or coffee, gambling, worrying too much or obsessing over a problem, or otherwise overindulging or engaging in the obsessive or aggressive behavior. If so, this card serves as a gentle and loving reminder that behaviors such as these can delay the manifestation of your dreams. This card also indicates a need to balance your desire for freedom and adventure with your responsibilities, because by honoring your commitments, you will prevent the buildup of karmic debt. By choosing to live as your higher self rather than giving in to your lower tendencies, you align with Source and the intentions of your soul. Everybody has a shadow side that needs to be acknowledged, embraced and loved. But when you learn to rise above it, you can make your dreams come true. In order to improve your current situation, you are being asked to adjust to, and harmonize with, the natural rhythm and cycles of your life—cycles that are encouraging you to exercise temperance and moderation. Have the courage to seek professional—or Divine— assistance if needed. You don’t have to go it alone; you can call upon your heavenly helpers for inner strength and courage. Animation: With temperance and moderation, I create balance in my life. This pick indicates a need to take a timeout from your busy schedule and the hustle and bustle of life. Perhaps you’ve been working too hard or have a lot going on. Maybe you’ve been tired, irritable, and anxious, or just generally feeling unwell. If you’ve been under stress of any kind or have been spending time in a negative or toxic environment, you must remove yourself from the situation to heal and recharge. This is the perfect time to take a vacation. Even a day or two away will revitalize and recharge your soul. You don’t necessarily need to leave your home; you could laze around the house and unplug your computer and phone. Having an energy healing, massage, or facial; soaking in a hot bath; taking a walk in nature; watching a movie, and reading a good book are perfect ways to unwind, center yourself, and feel a sense of renewal. In order to improve your current situation, you are being asked to adjust to, and harmonize with, the natural rhythm and cycles of your life—cycles that are encouraging you to take time out for you. If you’re feeling overwhelmed, uncertain, or confused, the answers will present themselves during your quiet time. Clarity comes from silence, and order follows peace. So step away from the stress and find your inner sanctuary. Animation: I take time out for myself and rebalance my body and my life. This pick indicates a time when a significant spiritual relationship is about to be forged. Perhaps it comes in the form of a friendship between like-minded souls on a similar journey toward enlightenment. Or maybe it’s a master/disciple relationship where an important individual enters your life. The saying goes, “When the student is ready, the teacher will appear,” and when yours arrives, he or she will assist you in expanding your spiritual growth. During the course of this relationship, you will play the role of both teacher and student, and the wisdom gained from this experience will enhance your connection to Source. Perhaps a spiritually minded person will broaden your understanding of the Divine. Maybe you become a catalyst in another’s spiritual journey and help that individual on his or her path. Regardless of the form, this spiritual relationship takes, it will serve your greater good. In order to improve your current situation, you are being asked to adjust to, and harmonize with, the natural rhythm and cycles of your life—cycles that are leading you toward a significant spiritual relationship. So pay attention to the speakers, teachers, and authors whose teachings you respect. Be on the lookout for people on a journey similar to your own. Embrace the opportunity to enhance your spiritual growth. Animation: Through a sacred spiritual relationship, I deepen my connection to Source. This pick indicates a need to surrender your attachment to a particular situation or preferred outcome because your inability to let go is impeding your success. Desperation blocks manifestation; therefore, the more you struggle to attract your desire, the more you push it away. By drawing this card, you are being encouraged to detach from the situation and surrender the outcome to the Divine. In order to attract what you want, you must give the Universe space to deliver your request. This can only be achieved by getting out of the way so that everything can unfold as it should. It isn’t your job to “make” it happen; it is simply your job to allow it to happen. When you surrender the outcome to the Divine, you let the magic flow. In order to improve your current situation, you are being asked to adjust to, and harmonize with, the natural rhythm and cycles of your life—cycles that are encouraging you to let go, trust, and surrender. Make peace with your life as it is today, and appreciate what you already have. When you do what brings you joy rather than fret about the end result, Divine order and timing will bring the perfect outcome your way. Animation: I receive the best possible outcome when I surrender to the Divine. This card indicates a need to reconnect with your creative side to improve your quality of life and align yourself with Source. By drawing this card, you are being encouraged to step out of your practice, logical mind and the seriousness of life in order to partake in lighthearted endeavors that are stimulating and fun. A playful creative expression is important because it raises your vibration, which brings you closer to your dreams. This is a time to immerse yourself in any creative endeavor that lifts your spirits and makes you feel good. It might take the form of playing a musical instrument, painting, writing, cooking, jewelry making, decorating, sewing, photography, landscaping, dancing, or designing—it doesn’t matter what it is as long as it brings you joy. Through playful creative expression, you can heal disharmony in your body . . . and disharmony in your life. In order to improve your current situation, you are being asked to adjust to, and harmonize with, the natural rhythm and cycles of your life —cycles that are encouraging you to express yourself creatively. It’s now time to use your imagination and see the world through the eyes of a child. For in rediscovering the creativity of your youth, you will rediscover the magic in your life. This pick indicates a time to keep moving forward as you strive to achieve your hopes and dreams— because, despite your current challenges, success is well within your reach. You are never given more than you can handle, and you have the strength and ability to make it through . . . so face your challenges head-on with determination, courage, and faith. With perseverance and persistence, you can make your dreams come true. By drawing this card, you are being encouraged to cultivate mental resilience and stability, since a calm and stable mind creates a calm and stable life. Make yourself aware of the negative thoughts and beliefs that are currently influencing you, and muster up the strength to develop a positive state of mind. In order to improve your current situation, you are being asked to adjust to, and harmonize with, the natural rhythm and cycles of your life—cycles that are encouraging you to persevere through your obstacles and challenges. Call for heavenly assistance when you need it, and have faith in your ability to create an exceptional life. The Oracle of luck tells us that a new period where there won´t be worries is coming into your life, where finally you can breathe easy or simply find relaxation. You will stop doing certain tasks that you never liked too much, there will be an increase in your free time to do whatever you want. The Oracle of luck says that in your life there will be abundance but not in the economic plane, but in life experiences. A new positive period will come into your life. In this period you will experience new sensations and experiences. It will be a very enriching period where there will be less routine. Possibly you will live in one of the most exciting periods of your life. You can finally get an acquisition which you have been looking for for a long time. This acquisition will bring great excitement to you and your loved ones since it will benefit all of you equally. Humans are very spiritual creatures and we are capable of limitless possibilities. However, we aren’t the only spiritual creatures on Earth. In fact, seeing these animals is an instant sign that higher vibrations may be trying to attract your attention to a certain matter. Animals are able to detect frequencies and attract positive vibrations. If positive vibrations are headed your way, you might see these animals in an oddly comfortable scenario. They might be weirdly comfortable with you or approach you like it’s nothing! This is because they can read your positive vibrations! Animals have a much bigger purpose on this earth than serving as food to humans. They are unique and spiritual creatures created by the cosmos to fulfill their own tasks for the metaphysical. They are conscious sentient beings that have feelings, dignity, and respect. Ancient documents and cultures have talked much about the spiritual significance of animals. For example, the ancient Egyptian cultures were very protective over their cats because they said they made bad energy and spirits flee. Even today, people keep house cats to banish all the negative energies. By watching the behavior of animals we can learn a lot about the universe and the primal instincts we have. It instills a deeper connection between you and that animal as spiritual beings. Watch out for these animals because seeing them means good things are coming your way! Hawks are very spiritual animals. They are wise creatures and old souls. They guide us more than you think. Their keen eyes and strong wings are a sign of resilience and power from the universe. The eagle is a universal symbol of freedom, due to its representation in the United States government. It is a sign of spiritual protection and moving into a higher consciousness. Ravens and crows are typically bad omens. If you are approached by ravens frequently, you might want to reevaluate the path you’re going down. They very well might be a warning to you. Seeing crows and ravens can indicate that you are going to enter a death and rebirth cycle. 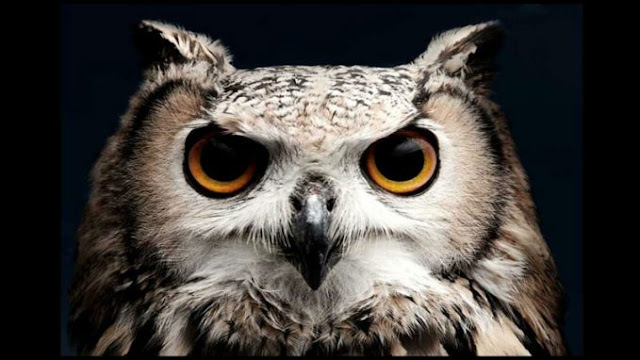 Owls are huge symbols for wisdom. They have very big, wise eyes and looking into them can reveal a soul. They are also reminders to pay attention to your intuition. These birds are typically associated with a message from a deceased loved one. They are said to be correlated with the spirit that of a man, and could possibly be a deceased father/grandfather. Bluejays are a lot like the Cardinals, just opposite genders. Seeing bluejays are a sign that a deceased mother/grandmother or other womanly spirit is trying to contact you; typically maternal. The praying mantis is a sign to remind us about the power of stillness. When you find a praying mantis be still in your life and listen to the peace. Seeing lizards is a sign that you need to pay more attention to your dreams. You might also see lizards a lot if you experience great amounts of deja-vu. The snake, or serpent, is often viewed as a symbol of evil. If you are hanging around with the wrong crowd, you might find yourself running into a snake or two. Check your boots. Spiders are symbols of spiritual connectedness. Tune into your creative potential and follow through with your creative ideas. Dragonflies are reminders that you are never alone. Pay attention to the people who care about you. The ladybug is often a sign of good luck. If you see ladybugs, pay gratitude to your loved ones. Seeing wolves are typically a warning sign, so when it happens, pay close to attention. This is a huge sign that you need to pay close attention to the people around you. They might need you. There’s a lot of debate revolving around the existence of the soul. Scientists are conducting extensive research on the topic. According to the Head of Astellas Global Regenerative Medicine and Chief Scientific Officer of the Astellas Institute for Regenerative Medicine, Robert Lanza, everything we experience and perceive is nothing but reflections of our minds. In an article published in Psychology Today, Lanza explained that objects only exist with real properties if they are observed. Space and time are the tools of the mind to put everything together and therefore, a part of our mind which is our soul exists outside of space and time. There are lots of ways in which our souls reflect our personalities. One of the ways to figure it how is considering our birth month. 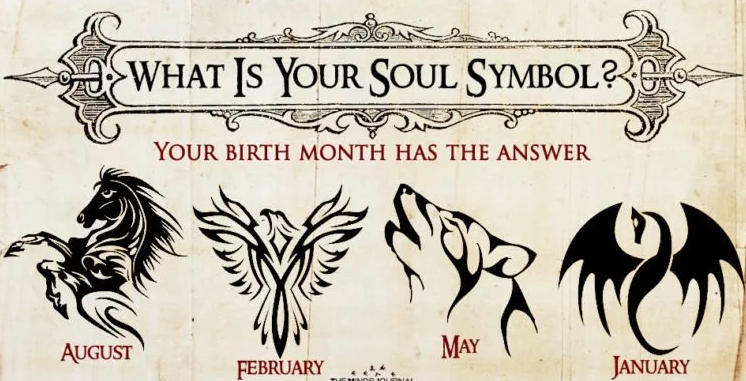 If we look at the month you were born and analyze the symbol of the soul of that month, your personality can be calculated. Like the first month of the year, you are the one everyone follows. You are strong-willed and have the potential to cross anything that comes in your way. However, keep that temper of yours in check. That might be a little bit of a problem because getting angry is not a good solution for everything. While you do get burnt into ashes like your soul symbol, Phoenix, you arise stronger and more powerful. You have immense tenacity which is the primary source of your strength. You seek balance in everything and always consider the good and bad sides of everyone. You have a positive approach towards life and situations. However, you tend to take only the good into consideration, always negotiating and solving problems. Just be a little careful because some people are too toxic to be good. Filled with immense passion, you are extremely bold and courageous. You take over the challenges you face and are loyal to the core. Protecting the people you love, you would risk your own life to take care of your clan. The leader of the pack, you prefer solitude sometimes and often don’t mind staying in the shadows. You are always there for the ones you love and those who threaten to harm your loved ones have to face you first. You’re the carefree spirit of the ocean and all you care about in this life is free. You avoid responsibilities but that’s not too realistic for you. Don’t ignore your instincts because they are your greatest of strengths.